The term back pain covers such a huge number of conditions, from the occasional irritation that comes and goes depending on what you do in a day, to the totally debilitating condition known as sciatica or nerve pain that stops you in your tracks. There are of course other degenerative and structural conditions such as disc degeneration, scoliosis, spinal stenosis, spondylolisthesis, bulging disc, disc herniation or disc rupture, just to name some of the many, that fit under the ‘back pain’ banner as well. The main thing about back pain or a back condition is most of the diagnosis is focussing on the part of the spine that is under pressure and causing the symptoms being felt by a person, rather than the reason that pressure is there in the first place. The fact is, many of the structural condition that exists cannot be changed easily and that is why a back problem that has been around for any length of time is considered serious and difficult to fix. There is a big, and often incorrect, assumption made with a back problem, that the structural issue as seen on a scan or x-ray is the reason that a person has the symptom they feel. The reality is this is not always the case. There have been a number of scientific studies done which have proved that just because someone has sciatica, scoliosis, a bulging or herniated disc, spinal stenosis e.t.c, they don’t have to have pain. In fact many people, who have surgery or long term treatment to fix these structural conditions in their back, often don’t end up with any relief from their symptoms. The reason for this is that there are many other factors that contribute to someone having back pain and an unbalanced pressure building up on a part of the spine in the first place. Dealing with these factors is a very important part of fixing a back problem yet it receives very little acknowledgement or attention from the conventional medicine approach. 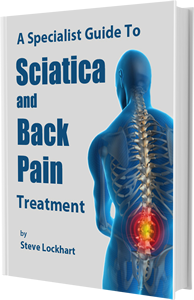 The information is made available at backpain.com.au and my free e-book download ‘A Specialists Guide to Sciatica and Back Pain Treatment’. It is a great way for people to better understand the ‘full’ story and facts about all back conditions, why you have it and what is the best way to get rid of any pain associated with it.